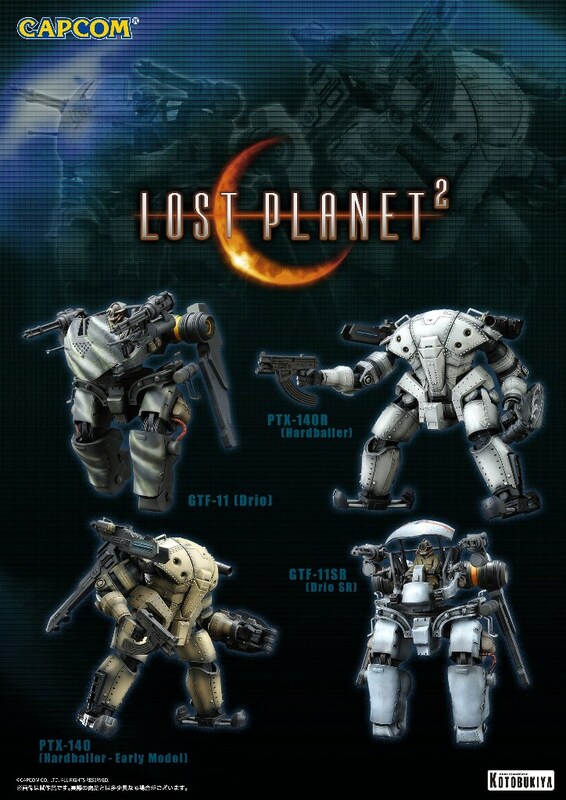 Kotobukiya has revealed their first PVC action figures for their Lost Planet 2 line.Capcom’s Lost Planet 2 is the sequel to the hit video game, and will be released for the xBox 360 as well as the PS3. 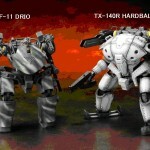 Kotobukiya is proud to reveal Lost Planet 2 PVC Action Figures: PIX-14R Hardballer and GTF 11 Drio. 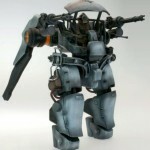 The figures perfecly replicate every details of armor and weapons as seen in Capcom’s upcoming new action video game, which is scheduled to be released in May, 2010 in Europe and North America. A KOTOBUKIYA Japanese import! Blasting your way out of Capcom’s upcoming sci-fi third-person shooter Lost Planet 2 (sequel to the hit Lost Planet: Extreme Condition) are two Vital Suits appearing for the first time in Kotobukiya’s new action figure line! The first in the new lineup is the heavy combat PTX-140R HARDBALLER. 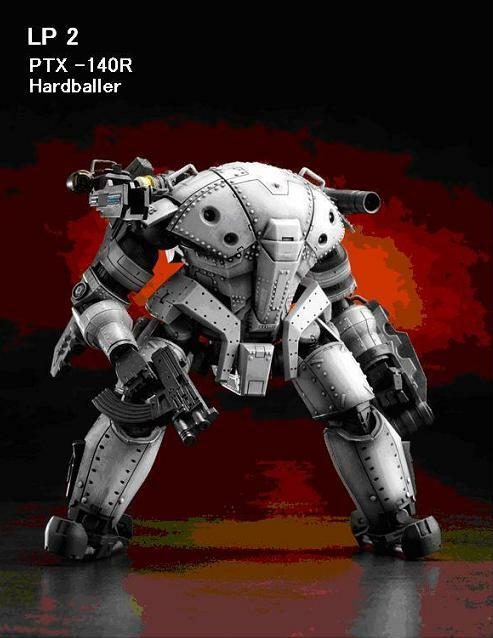 Based on the prototype for the famous “Ivan” suit, the Hardballer has been upgraded to the current R Type with additional components and cutting edge technology. Covered in thick armor plates, the Hardballer mounts heavy weapons and a rear power pack for bursts of speed. 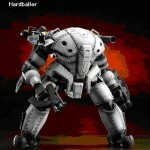 The hard-fighting Hardballer Vital Suit is 6 inches of destructive capability. Pose yours for combat with 20 points of articulation, and an exclusive ball-jointed system that lets you interchange weapons with other Lost Planet 2 releases. The Hardballer comes fully equipped with a rocket launcher, two laser rifles, and a heavy-duty chain gun for maximum destruction focused against pirates and the alien Akrid! A KOTOBUKIYA Japanese import! 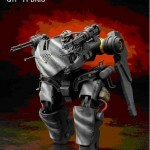 The second Vital Suit action figure from Capcom’s upcoming sci-fi third-person shooter Lost Planet 2 (sequel to the hit Lost Planet: Extreme Condition) is the aerial combat unit GTF-11 DRIO. Originally developed for zero-G operations, the current Drio model features a multi-jointed body for full attachment capabilities of weapons as well as cutting edge attitude control technology. With an open cockpit for full visibility of the battlefield and a humanoid shape streamlined for aerial combat, the Drio is a deadly unit utilized by pirate forces as well as NEVEC. Standing at approximately 5 ½ inches tall, the Drio Vital Suit is the perfect weapon against opposing aerial combatants and the agile Akrid. With 20 points of articulation and the exclusive ball-jointed system that lets you interchange weapons with other Lost Planet 2 action figures, the Drio gives you many display options. 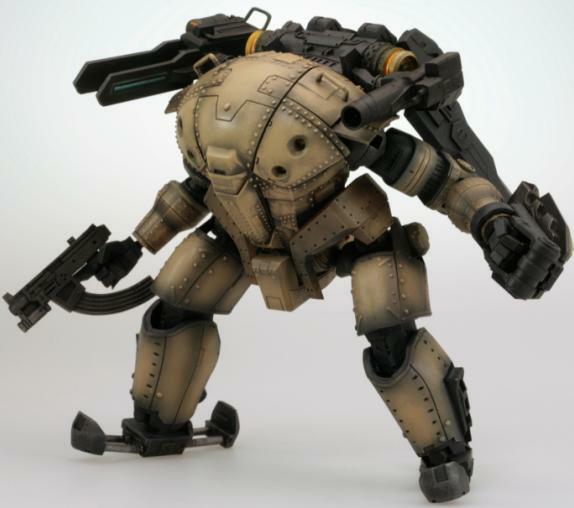 No pushover on its own, the Vital Suit comes equipped with both chain gun and gatling gun, and it includes a miniature Mountain Pirate pilot figure! A KOTOBUKIYA Japanese import! Blasting your way out of Capcom’s upcoming sci-fi third-person shooter Lost Planet 2 (sequel to the hit Lost Planet: Extreme Condition) are two Vital Suits appearing for the first time in Kotobukiya’s new action figure line! 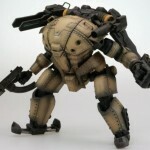 Pose your Vital Suit action figures for combat with 20 points of articulation and an exclusive ball-jointed system that lets you interchange their weapons. 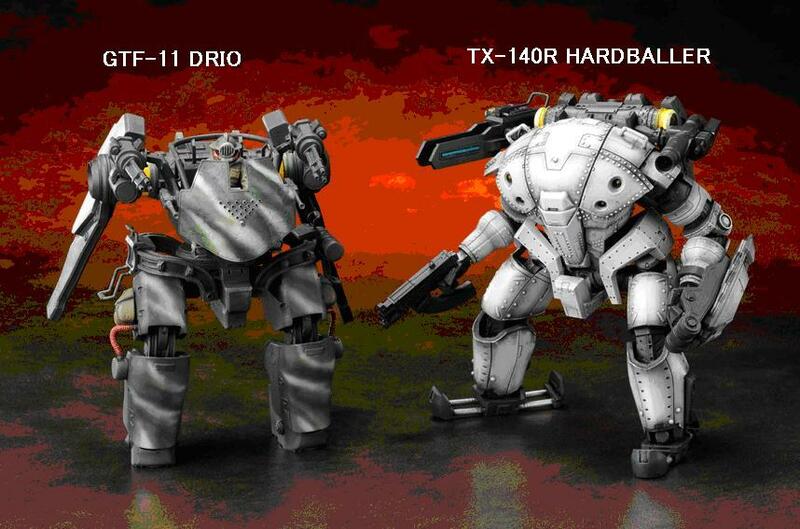 PTX-140R HARDBALLER is 6 inches of destructive capability. Comes fully equipped with a rocket launcher, two laser rifles, and a heavy-duty chain gun for maximum destruction focused against pirates and the alien Akrid! 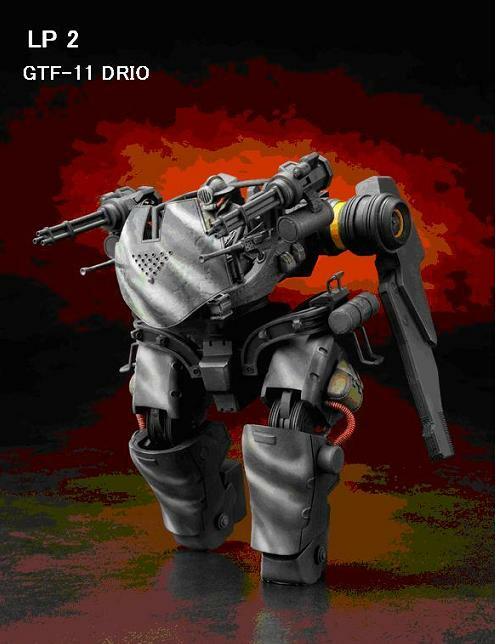 GTF-11 DRIO with an open cockpit for full visibility of the battlefield and a humanoid shape streamlined for aerial combat. Standing at approximately 5 ½ inches tall, the Drio Vital Suit comes equipped with both chain gun and gatling gun, and it includes a miniature Mountain Pirate pilot figure! 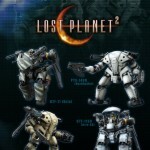 Click the headline of the story for images of all the Lost Planet 2 figures.